Imagine this…you are on a beautiful, peaceful island laying in a hammock. You’re completely relaxed, the sun is shining and you’re sipping on coconut water. That scene, especially the coconut water, brings back great memories from when I lived in the Dominican Republic. I used to drink the water from a whole coconut and then eat the white meat inside. YUM! 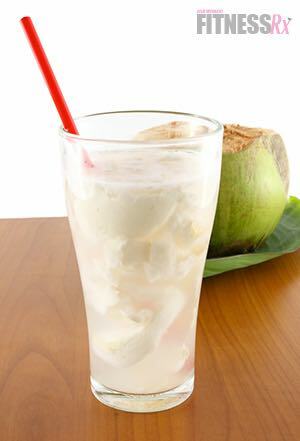 Coconut not only tastes good, it also contains many vitamins and minerals and is rich in fiber. It is considered a “functional food” due to the many health benefits it provides. In fact, different forms of coconut have been and still are incorporated in many medicines today. It can help treat, bronchitis, nausea, tumors, upset stomach, irregular menstrual cycle, menstrual cramps and more. It can also target bacteria that cause pneumonia, throat infections, ulcers and more. As a medium chain fatty acid (MCFA), coconut oil is easier to digest than the longer chain fats and thus provides energy more quickly. 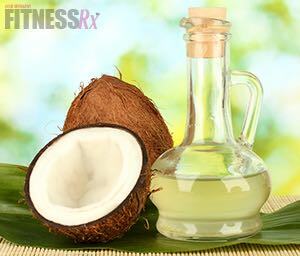 Coconut oil also helps with digestion and can reduce inflammation. Coconut water is excellent for hydration—in fact, it’s one of the highest sources of electrolytes in nature. 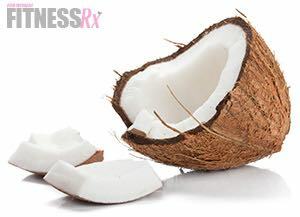 The list for coconut benefits can go on and on! 1. Flavor-boosting healthy fat. I’m not a big cook, but if I was, I would use coconut in a lot of my recipes. Not just because it tastes and smells good, it’s also one of the best oils to for high heat cooking. So, try using it the next time you are sautéing veggies, meat or fish for a subtle flavor-boost. Also, I love coconut rice—my mom used to make it for us when we were kids. To make your own coconut rice, bring 2 cups of jasmine rice, 1-½ cups of water and 1 cup of coconut milk to a boil. Stir and reduce the heat to the lowest setting and cover the pot tightly with a lid. Cook for another 15 minutes. Once it’s done cooking, you can mix in a little coconut oil, for a more intense coconut flavor. 2. Hair & skin moisturizer. Get shiny, moisturized locks with a coconut treatment. Mix a few teaspoons of coconut oil, an avocado and an egg yolk and…BAM! You have a homemade natural recipe beautiful hair. Coconut oils are also great for moisturizing the skin. You can use the same jar you buy to eat on your skin. It is easily absorbed into the skin and will sooth dry skin. 3. Post-workout recovery. A great source of electrolytes and natural sugars, coconut water is great for hydration and refueling after a hard workout. Try mixing your post-workout protein powder with 6oz of coconut water instead of regular water to amp up your post-workout nutrition. Wolfe, David. Superfoods. Berkeley, California: North Atlantic Books, 2009. Print.